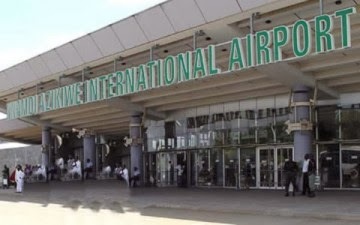 Another air disaster was averted at the Nnamdi Azikwe Airport, Abuja on Monday as a Med-View Airlines aircraft from Lagos suddenly took to the air again at the point of landing in Abuja.The pilot told the passengers that he took to the air again to avoid a collision with another aircraft on the tarmac.The airline Flight VL2104 took off from the Murtala Muhammed Airport, Lagos at noon and was scheduled to land in Abuja at about 1.05pm.The pilot had already announced final descent into Abuja and asked all passengers and cabin crew to fasten their seat belts but the pilot suddenly took off to the air again with barely 30 seconds to touch ground.The plane had 150 passengers on board. After about three minutes of gaining altitude, the pilot announced that he decided to take off again to avoid colliding with an aircraft that was on ground.He said that after he had been granted clearance to land, it was later discovered that the other aircraft was not fast enough, hence his decision to take off.The aircraft hovered for another 20 minutes in the air before finally landing at about 1.30pm.While the drama lasted, the passengers were panic-stricken, especially when the plane entered into turbulent weather on air. The incident came less than a month after an Embraer aircraft operated by Associated Airlines with registration number SCD 361, conveying the corpse of a former Governor of Ondo State, Chief Olusegun Agagu, from Lagos to Akure for burial, crashed on October 3 shortly after take-off at Murtala Mohammed Airport, Lagos.Thirteen passengers in the crashed plane were killed, including a commissioner in Ondo State, Deji Falae.